A quick rundown of the nation's fastest-growing wireless provider. Among the major U.S. wireless carriers, no company is as fascinating as T-Mobile (NASDAQ:TMUS). Under the leadership of CEO John Legere, the "Un-carrier" has fundamentally changed the U.S. wireless industry, sparking an unprecedented wave of innovation and competition. In the process, it's become the nation's third-largest wireless provider, overtaking rival Sprint (NYSE:S) late last year. T-Mobile's stock is similarly interesting. In the next five minutes, you'll gain the knowledge you need to assess the firm, and what factors drive its business. Before we get into T-Mobile's actual operations, there are two interesting facts about the company investors should be aware of. First, while T-Mobile is a publicly traded firm, it is considered a "controlled company" -- the vast majority of T-Mobile is owned by Deutsche Telekom. The German telecom giant controls T-Mobile's board of directors and almost all shareholder voting rights. T-Mobile will, as a company, operate in a way that best serves Deutsche Telekom's interests. More often than not, those interests will align with common shareholders, but that may not always be the case. Second, T-Mobile has long been seen as a takeover target. This isn't idle speculation; it comes directly from Deutsche Telekom's management. They've made no secret about their desire to sell the wireless carrier. In the past, potential suitors have included Sprint, Dish Network, and French telecom firm the Iliad Group. Obviously, no such transaction has taken place -- disagreement over valuation and regulatory issues have, at times, gotten in the way. Still, the prospects of a sale (or lack thereof) are likely to remain a major contributing factor when it comes to T-Mobile's share price performance. T-Mobile's business in and of itself is fairly straightforward: The firm provides wireless phone and Internet service. Unlike its larger rivals, such as Verizon (NYSE:VZ), it has no hardwire operations, paid-TV business, or online assets for investors to concern themselves with. Its revenue is generated exclusively from its base of some 63 million customers, who mostly rely on T-Mobile for their smartphones. Not all of these customers are the same, however, and it's important to understand the different profiles of the individuals T-Mobile serves. T-Mobile's customers can be placed in three buckets: postpaid, prepaid, and wholesale. Postpaid customers are what most investors might think of as traditional T-Mobile subscribers. They pay their bills at the end of their billing periods. Often they're more creditworthy, but more importantly, they may be more likely to stay with T-Mobile in the long-run. Prepaid customers -- as the term implies -- pay their bill in advance, often because they lack the credit score needed to become postpaid customers, or because they simply prefer not to entangle themselves in long-term customer relationships. T-Mobile's MetroPCS brand is among the leading U.S. providers of prepaid phone service. Wholesale customers make use of the T-Mobile network, but not through T-Mobile itself -- they subscribe to a mobile virtual network operator (such as Project Fi) that uses T-Mobile's network. T-Mobile receives revenue from these customers, but not directly. When judging T-Mobile, or for that matter any of its peers in the wireless industry such as Sprint or Verizon, the single most important number in any given quarter is the total number of postpaid customers the company has added or lost. These customers are the most valuable, and typically generate the most revenue. In 2014, postpaid customers generated 64% of T-Mobile's revenue, while prepaid customers accounted for 31%. Wholesale customers accounted for the remaining 5%. Average revenue per user (ARPU) is also vital. A growing base of customers may not matter if they're spending less; inversely, a stable base of customers may be fine if they're spending more. Among T-Mobile's postpaid phone customers, ARPU came in at $48.05 last quarter, roughly unchanged from the prior year. Setting aside the prospect of a takeover, T-Mobile can be valued like other telecom firms. Telecoms often spend inordinate amounts of money on infrastructure, and T-Mobile is no exception. Last year, it spent $4.7 billion, mostly to expand and improve its 4G LTE network. For 2016, it plans to spend another $4.5 billion to $4.8 billion. It was outspent by Verizon -- which invested $11.7 billion in its network -- but added more postpaid phones. This commitment to large capital expenditures, and the resulting long-term depreciation, often entices investors to look at EBITDA rather than earnings when assessing the value of telecom stocks. EBITDA -- which stands for earnings before interest, taxes, depreciation, and amortization -- can provide greater insight into the performance of a telecom's core business. In 2015, T-Mobile shares rose more than 40% as its adjusted EBITDA rose 31.2% on an annual basis. Comparing a telecom's enterprise value (EV) -- the total value of the firm -- to its EBITDA is often used to assess the relative valuation of one telecom to another. 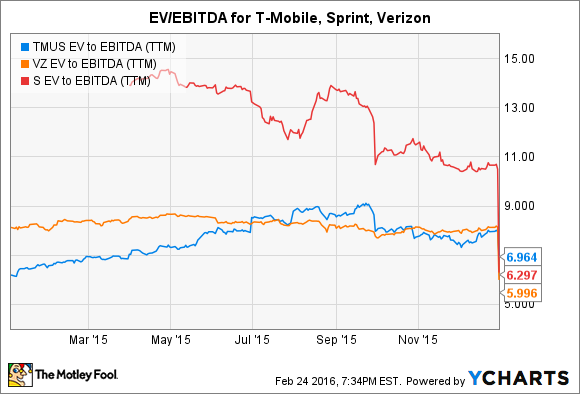 On an EV/EBITDA basis, T-Mobile is slightly more expensive than Sprint and Verizon. And there you have it -- the information you need to understand the Un-carrier. Hopefully that was easier than choosing a new phone plan.